Go ahead; I can take it. "This is Not What I Meant When I Said I Wanted a Red Ryder!" The sashaying Shetland was my Grandmother Athalia Barker's beloved pony "Max." 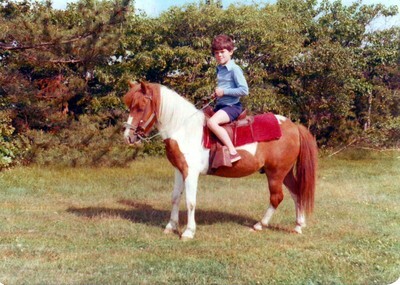 This was the nag that I and my cousins first learned to ride, which for all his small size was harder than it might seem. Max could expand his barrel of a belly to a prodigious girth, thwarting all attempts to cinch a saddle. He was just as likely to roll over as canter under a low hanging branch to rid himself of an impudent rider. In addition to the western saddle with the red wool blanket, he also pulled a pony cart, in which he was far less rambunctious. Max was the primary lawnmower at Windrock during the 1970s. There were shovels and a wheelbarrow instead to follow him about with and gather up excess manure. In later years he preferred standing with his hind legs crossed, and he lived beyond 30. Judging from the wide collar of my dress shirt, I'd say I was probably just finished with 3rd or 4th grade in this picture (1977-1978). I am sure during the summer I only wore my red Keds when my feet were in stirrups. Max and I are actually reined up rather near the bluff overlooking the bay, but I am certain that there was no risk of him deciding to plunge. Not when the barn and the barrel of sweet feed lay in the other direction. My stern expression may betray a suspicion that my rotund steed is poised to bolt. Today the barn is filled with many things, including hay for my Aunt's horses at her home down at the end of Great Neck, but alas, no resident equine species. But all my friends have real horses! Why must I ride one stuffed at Acme Taxidermy? I want a real horse! This is not what I had in mind when I said I wanted a Red Ryder! Pick the one you like and cast your vote! Results on April 12th. Perhaps it is because I am rather closely related to the barelegged cavalier in this archival image, but it strikes me as rather droll and suitable fodder for the 15th Walking the Berkshires Family Archive Caption Contest. We'll put your finest offerings to a vote next week. Crone on Camel Creatively Captioned! 19 readers of Walking the Berkshires cast their vote in the 14th Family Archive Caption Contest. 8 (42.1%) of you, supported the leading caption, while 6 (31.6%) supported the next most popular submission. "I'd Walk a Camel for a Smile." 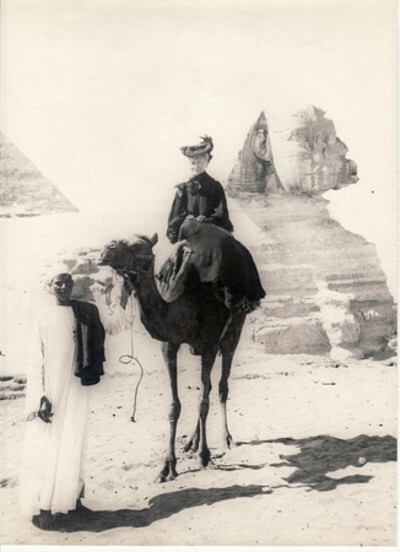 This rather extraordinary image is my Great, Great grandmother Alice Jane (Greene) Barker on an Egyptian holiday at Giza in 1904. She is clad in mourning for her late husband, Samuel Barker, Jr., who died the previous year. She was accompanied on this trip by her son Lloyd (not to be confused with the criminal of that name), who had suffered from respiratory problems since childhood. Now I have ridden on a camel in the the semi-desert of northwestern Namibia but never attempted to do so side-saddle, let alone clad from head to toe in heavy black. Alice Jane Greene Barker was a published poet and an indomitable traveler, but this picture which my cousin Karen found recently is the first I was aware that she had sojourned to the Sphinx! 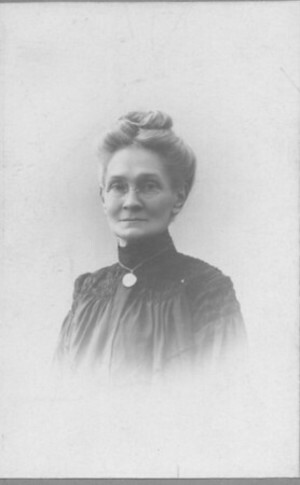 She also had very strong genes, as there is much in her facial features that strongly resembles her son Raymond H. Barker, Sr. and her grandson Robert H. Barker (my grandfather). The nominees have been selected, and the ballot is in your hands. Which of the following should win the 14th Family Archive Caption Contest here at Walking the Berkshires? Polls close Friday p.m., March 7th. Cast your vote below. 3. I don't care how economical it is, Edgar. I want the Buick saloon. The crone on the camel's our Mummy, not yours! The 14th Walking the Berkshires Family Archive Caption Contest is now accepting your entries! Voting will commence on Monday next. The nominations are now closed and it is time to put put the question to a vote. Which of the following captions submitted by waggish readers of Walking the Berkshires best applies to this ancestral image from my family archives? 1. As they merrily celebrated Oktoberfest, Wilhemina had the sinking feeling Nigel was skirting disaster. 2. "We've switched Hal and Lois' Folger Crystals with high-octane, homemade corn liquor. Let's see if they notice!" 3. "You used a flutaphone for WHAT?" 4. Aunt Maude and Uncle Earl celebrate that he was able to dodge the draft! The free and fair polling services of Vizu unfortunately have a character limit, so please refer to the fulll text above when voting for your favorite below! Polls close in the morning of Feb 3, 2008. After an extended hiatus - due not to a writer's strike but to an absence of suitable material - Walking the Berkshires is proud to offer its readers its latest Family Archive Caption Contest. Now even more free and fair with a transparent popular voting process, there is not a single reason not to match your wits and whimsy against the legions of contestants who shall vie for the coveted and most dubious honor of caption winner for this lucky 13th edition. Look well on these departed shades. They will not take amiss your japes and jocularity at their expense. Do these look like the sort of vengeful spirits who would deny you the opportunity to demonstrate your puissance with puns, deftness at doggerel, wry remarks and sly asides before all and sundry? They are not taking themselves seriously, and neither should you. You can't win if you don't play, so give us your best and caption this!